While looking through photographs of my tour in Vietnam, in preparation for our USMCVTA Reunion in Charleston, I was surprised by the number of shots that included tanks with damaged track. It got me to thinking about instances during my tour in Vietnam, where we either hit a land mine or slipped track and had to button it up and move out. It was late April 1967 and we were on the tail end of a sweep just south of the DMZ. It may have been part of Operation Prairie...at least it was during that time period. Our tank was A-42 (3rd Marine Tank Battalion) and it always seemed to be plagued with mechanical problems. Some said it was a "bad luck" tank. Earlier in the war it had been hit and penetrated by an RPG and that was probably the beginning of its bad reputation. We had our share of superstitious guys in the battalion and at least one had told me that he thought the tank was "jinxed". But I had never been superstitious and I really liked going out in A-42. Maybe it was because the tank had a bulldozer blade on the front and I felt that was extra protection. For whatever reason, I was more comfortable on A-42. Paul Ratliff was part of that crew but I can't remember who the others were. It seemed as if our tank crews were changing weekly, back then. After 46 years, Leon Sack received a letter that reminded him of a special Christmas gift from long ago. In 1966, 11-year-old Barbara Hood (Duffy) received an assignment from her sixth grade teacher, Charlotte Hogan. Her class was asked to write a letter to an unknown soldier stationed in Vietnam. When Master Sergeant Leon Sack went to the post office to pick up mail for his crew, the attendant told him about a group of letters received from school children back in the States and asked if he was interested in taking some of them. George Langley of Eastpoint, Florida was born on October 31, 1947. He left home an ordinary boy at 17 years of age and came home a decorated service man with a broken spirit. George's brother, Winfred, provided a history of the family's military service. Both maternal uncles served in the Navy during World War II, and one paternal uncle also served in the Navy. He survived the Pearl Harbor attack, but just a few months later his ship was sunk by a Japanese submarine. He and many others were categorized as lost at sea. 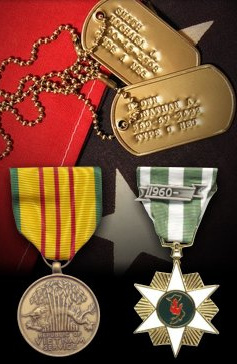 Patrick Bieneman I served in Vietnam from April 1968 to April 1969. I was an Infantryman in Charlie Troop, 1st Squadron, 9th Cavalry Regiment, of the 1st Cavalry Division. Peter J. Ritch - Memories from Peter J. Ritch, USMC 1967- 1970. Viet Nam, 1968-1969 and a member of the USMCVTA.